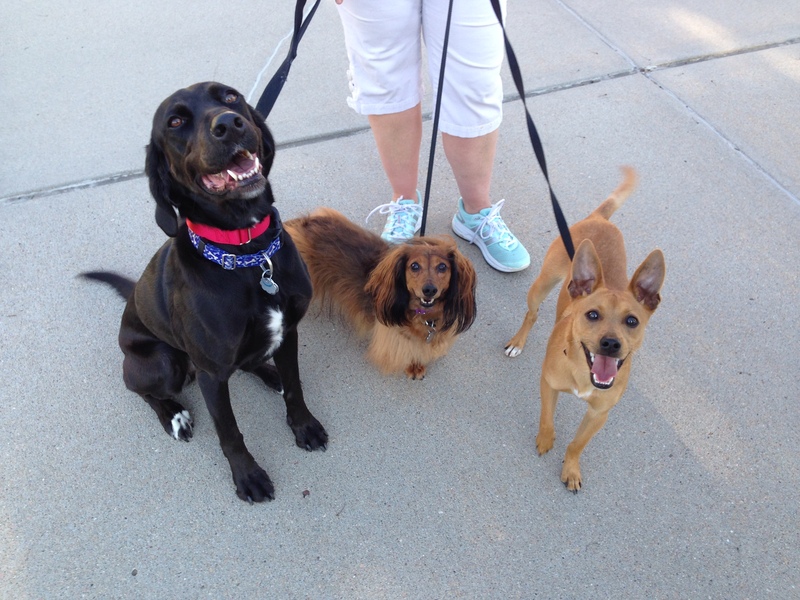 For this session I worked with Skylar, Spud and Paco (from left). Their guardians called me in primarily to work with the new dog Paco as he was showing some dominant and territorial behaviors. But I asked their guardians to leave the other dogs out for my arrival so I could see if they needed work too. It didn’t take long to see that was the case. When I came into the house, Paco was barking at me with his hackles raised, was snarling, his ears were forward and his body was tense and flexed. He also darted forward at times letting me know he disagreed with my arrival. I kept him in front of me and blocked him when he tried to circle around. At first I chalked this up to being territorial as many dogs declare themselves the sheriff or head or security. But when my apprentice Tara came in a minute later, Paco didn’t show her any of the same behaviors. This makes me believe that the dog has a specific issue with males so I pointed this out to their guardians for future reference. It quickly became clear that the three dogs energy was playing off one another. While they all had distinct personalities, the more excited they got when playing, the more intense their reactions were. I asked their guardians about any rules or structure they had in place for the dogs and it turns out they didn’t have many. While you can get away with a less structured setup with one dog, multiple dogs do much better with clear rules, boundaries and limits. I suggested a few new rules and boundaries then showed their guardians how to communicate them to the dogs and correct when they broke them. Timely corrections are key as the timing of the correction helps the dog understand what it was doing that produced the reaction from the human. The better the timing of your correction is, the quicker the dog learns and understands. In our discussion I learned that getting the dogs ready for a walk was a major source of excitement amongst the dogs. I asked their guardian to go through the process so I could see it for myself. As soon as the guardian asked if they were ready to go for a walk, they got up and started to get excited. As she walked to the room with the leashes, Spuds ran way in front of his guardian and was waiting under the leash rack before the guardian got there. Clearly the dogs associated the action of getting the leashes with the walk and this triggered an increase in their excitement and energy levels. I called their guardian back and asked her to repeat the process but this time without saying anything. I also instructed her to stop or pause the instant that she saw the dog’s energy level go up. We broke the action of getting the leashes into small individual parts; walking over to get the leashes, picking the leashes up, reaching over to attach the leash, etc. I told the guardian to go through these parts, one at a time and to immediately stop as soon as she saw any of the dogs start to get excited. Spud was the most challenging. He kept running over to the leashes in front of his guardian and Paco followed along. After two or three aborted attempts, Skylar figured it out and stayed laying on the floor. Each time the guardian stopped or paused, she waited until the dogs returned to a completely calm and balanced state before trying again. We kept at it step by step until the dogs stayed calm and behind their guardian as she went to retrieve the leashes. The difference in energy level was clearly apparent. Next I addressed the over excitement at the door. Clearly a big part of Paco’s reaction to guests arriving was his excitement level. This is often impacted by how close the dog is to the thing its reacting to. By increasing the distance, we can help the dog stay calmer. To accomplish this, I showed their guardians how to claim the area around the door and communicate to the dogs that they were to stay a good 10 feet away. While I was able to get the dogs to move away from the door using my movement and body language, their guardian had a more difficult time. She had some softer movements that were a little late and the smaller stature of the dogs made it easier for them to go around her. Her timing and form will improve as she repeats the exercise, but to help in the short-term I gave her a tennis racket to use as an extension of her arm. On her second run through of claiming the door, she was far more effective. They barked less and were much easier to move away from the door. Now that we had established some rules and structure, I wanted to work on the dogs walking skills. Some of the dogs pulled and reacted on the leash which made walks a challenge and not that enjoyable. I fitted the dogs up with Martingale collars then showed their guardians how to add the special twist to the leash to stop the pulling. Because each dog had individual issues, we worked with them one at a time. First up was Paco. Paco did pretty well. He pulled ahead at times but his handler was easily able to correct him. Within a dozen steps or so he was walking at a heel with a loose leash checking in with his handler every few steps. Next up was the big dog Sklar. Due to her size, she was the strongest puller, but the Martingale combined with taking our time in getting them leashed up made a big difference. She needed almost no corrections and was pacing herself to stay next to her handler. Because Spud was the elder dog and had a pervious leg injury, he didn’t need much work on the solo walk so after his turn, we made things more challenging by walking Paco and Skylar at the same time. After walking Paco and Skylar together in a perfect heel, we added in Spud and his guardian headed out with her pack. Even though she won’t be walking Spud with the other two dogs due to his lower energy and leg injury, I wanted to have all the dogs walking together while remaining calm and in a heel. By the end of the session, the dogs were much calmer, were listening to their guardians and no longer getting over excited or over reacting to knocks at the door and other triggers. The only behavior that I have reservations about is Paco’s initial aggression. Based on what I saw in the session, I suspect that as the dog starts to see and identify his guardians as being authority figures, this reaction will subside. It will be important for their guardians to continue practicing the exercises and using the new non verbal communication methods so that the changes in behavior we accomplished in the session become permanent.